bl.uk > Online Gallery Home	> Online exhibitions	> Asia, Pacific and Africa Collections	> Dusaswumedh Ghat. Benares. 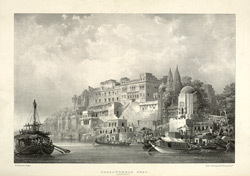 Plate 7 from the third part of James Prinsep's 'Benares Illustrated'. Prinsep (1799-1840), an antiquary and colonial administrator was assay master at the Benares Mint between 1820-30. The lithographs published in this collection were based on his original sketches of the various views of the 'holy' city of the Hindus. Of this plate he writes: 'The period of bathing at this ghat lasts from the 2nd to the 10th day of the whole half of the month Jyestha. The commanding edifice in front us a Bruhmapooree or place of abode for brahmuns of the panch-dravir castes, built and endowed by Uhilya Baee. It is provided with lodging, found and attendance for 60 tenants, who are, properly speaking, not to take up a permanent residence, but to be mere passengers: this regulation is but little attended to. To the left, the brahmunical edifice or chhutra unites with Shreedhar Moonshee's ghat. The unfinished temple in front denotes the death of the Marhatta, who founded it, before it was completed...'.